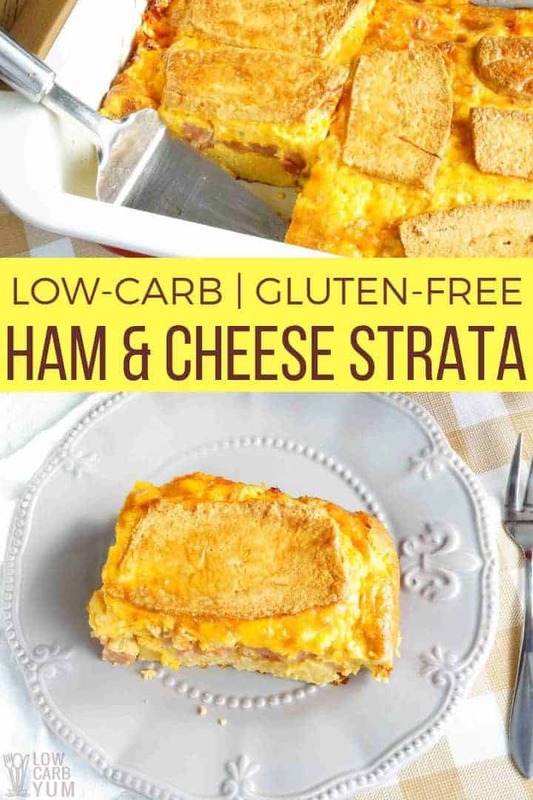 A gluten free ham and cheese strata made with low carb bread. It’s prepared the night before and baked in the morning. Perfect for a holiday breakfast. 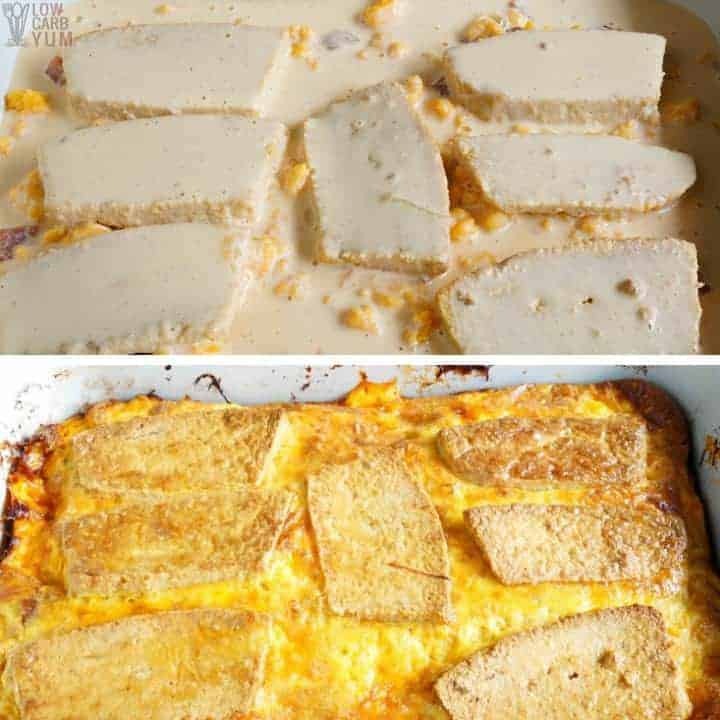 During my day off this week, I put together a new low carb breakfast casserole. 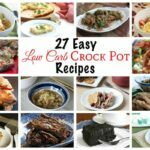 I’ve been looking for a recipe to make for Christmas morning that is put together the day before. The savory casserole I came up with is a ham and cheese strata. 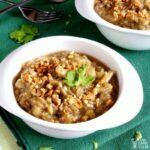 It’s a recipe using my basic low carb bread. 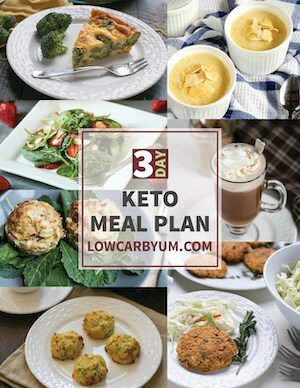 But you can use any of my savory low carb bread recipes for the strata. I’m still undecided if I want a savory or sweet casserole to serve. I suppose there’s no harm in serving up one of each. It would be like a main meal and then the dessert. Maybe I’ll just make keto cinnamon rolls rather than a sweet casserole to serve at our holiday breakfast. 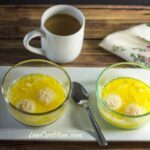 I’ve found so many low carb breakfast ideas, it’s tough to settle on just a few. What is ham and cheese strata? 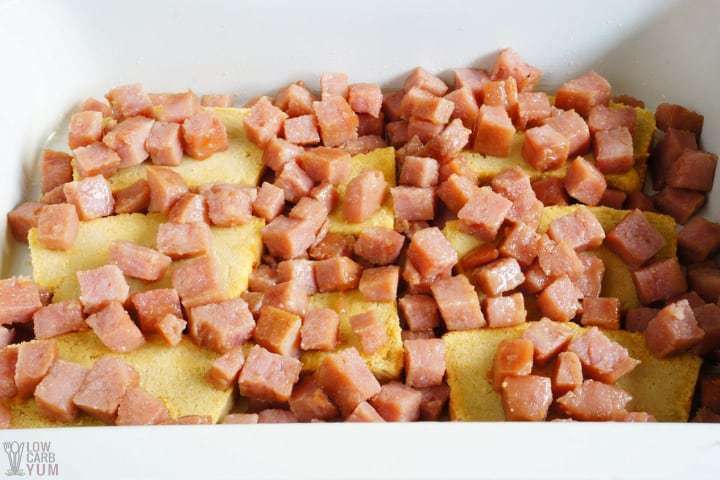 Cheese strata with ham is a popular dish that is often served at a holiday brunch. Strata is a layered breakfast casserole made with bread, egg, and cheese. The word strata means layers. And when it comes to food, the word refers to a dish where bread is layered with the filling to create strata (or layers). Strata is similar to an egg and cheese quiche or a cheese frittata in that the main ingredients are eggs and cheese. However, this dish differs in that bread slices are typically included. There an also be meat and vegetables in the casserole. I like to make my own low carb bread. But you can buy bread as well. 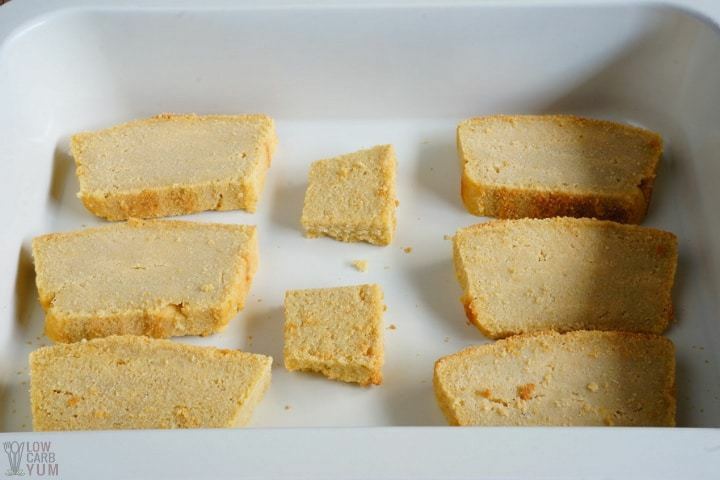 ThinSlim Foods makes a low carb bread called Love the Taste. You can also buy fresh baked bread from LC Foods. If you made your own keto bread, you’ll want to slice the loaf. I like to use a bread slicer to get perfect slices. For my 9×5-in loaf I got 16 slices. It’s best to cut the crust off the bread slices. But don’t throw those crusts away! 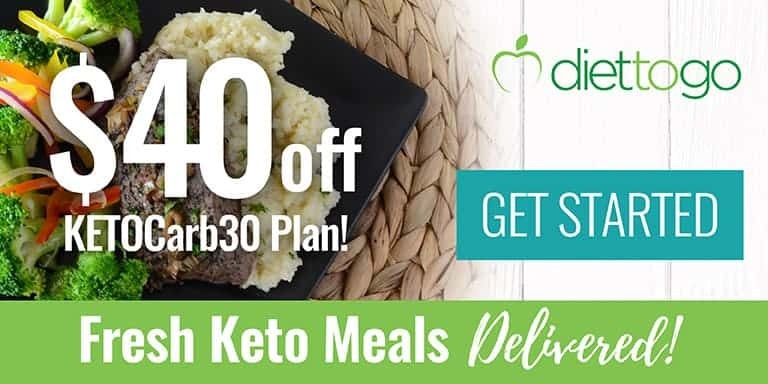 They can be used to make keto meatballs, low carb meatloaf, or sprinkled on top of casseroles. You’ll want to start with a layer of bread slices. Next the diced ham is sprinkle over the bread. 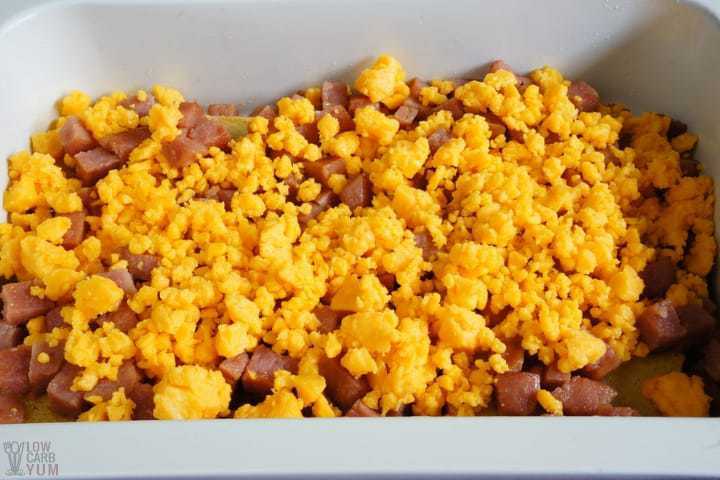 Shredded or grated cheddar cheese is spread over the ham to complete the middle layer. 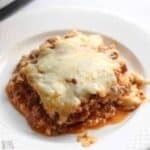 The casserole is topped off with a second layer of bread slices. Then a mixture of heavy cream, water, and eggs is poured over the layers. 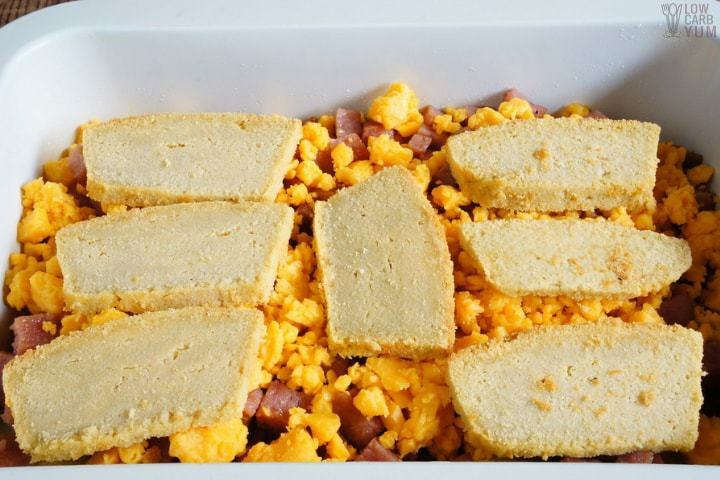 Once prepared, the casserole is placed in the refrigerator so the bread soaks up the egg and cream mixture. It’s preferable to have it sit overnight. 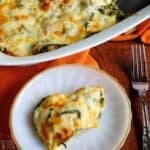 This makes it a perfect make ahead casserole for a holiday brunch! It’s best not to bake the prepared casserole straight from the refrigerator. After taking the casserole out of the refrigerator, it should be allowed to sit at room temperature while the oven is preheating. The layered ham and cheese strata egg casserole is baked until the top is brown. The top layer of bread slices should toast up a bit and the egg mix should brown up on top. 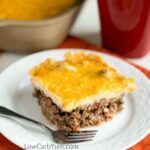 This gluten free low carb breakfast casserole is chock full of deliciousness. And it doesn’t require that much preparation, although you will need to either bake or buy the bread. Plus it can be made the day before! 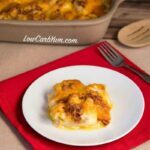 I’m confident that you are going to love this low carb ham and cheese strata! There is quite a bit of sodium in this dish so if you are watching sodium in your diet, you may want to cut the salt out of the recipe and use a low sodium ham. 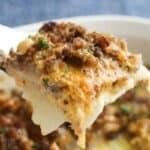 I hope you enjoy this easy to make layered breakfast casserole. And let me know what you think in the comment section below if you do give it a try. 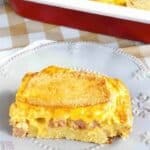 A gluten free strata breakfast casserole made with low carb bread. It's prepared the night before and baked in the morning. Perfect for a holiday breakfast! Arrange seven slices of bread in a single layer on bottom of a greased 13x9-in baking dish. 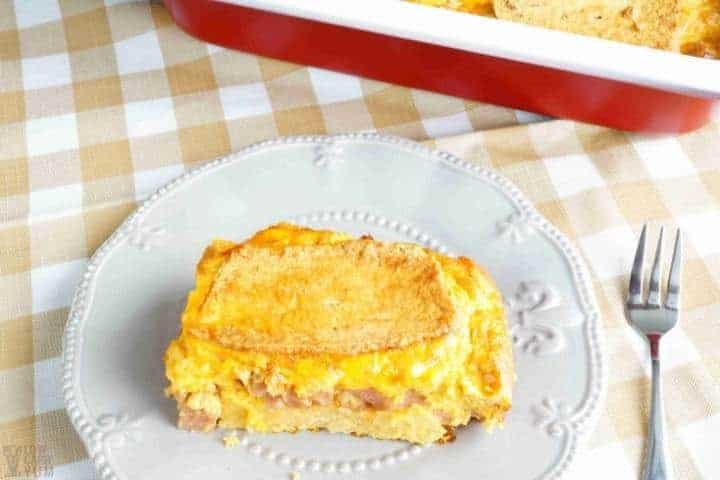 Top with ham and cheese. Cover with remaining bread slices. In large bowl, beat together eggs, cream, water, Worcestershire sauce, mustard, salt, onion powder, pepper, and cayenne pepper. Pour over all. Cover and refrigerate overnight. Preheat oven to 350°F. Remove casserole from refrigerator and let sit at room temperature while oven preheats. 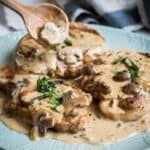 Uncover casserole and bake at 350°F for 50-60 minutes or until browned. Remove from oven and let cool about 15 minutes before serving. Any bread can be used in the recipe. But the crusts should be cut from the slices for the best results. The crusts can be saved to be used as bread crumbs for meatballs, meatloaf, and casserole toppings. Pre-shredded cheese typically contains an anti-caking ingredient that isn't carb friendly. That's why it's best to grate your own cheese with a cheese grater or food processor. The casserole should be set in the refrigerator for at least a few hours to allow the bread slices to absorb the egg cream mixture. It's best to make the casserole the night before serving. 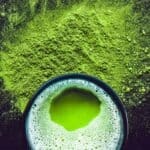 Post updated in December 2018. Originally published December 2014.